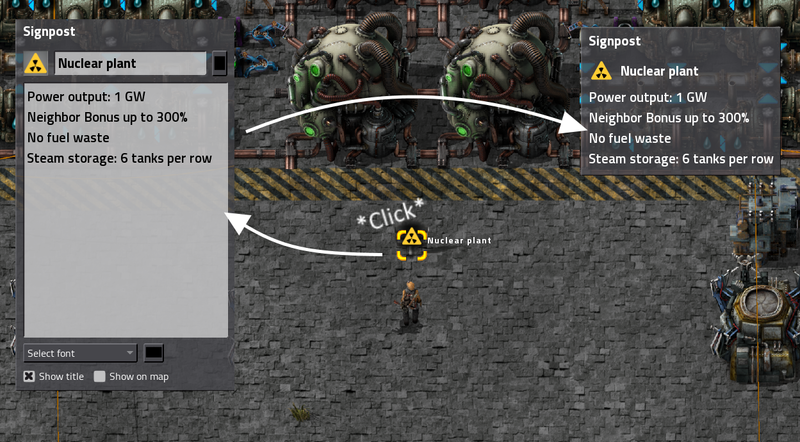 Attach notes to blueprints/books, combinators, entities... almost everything. Also adds signposts. 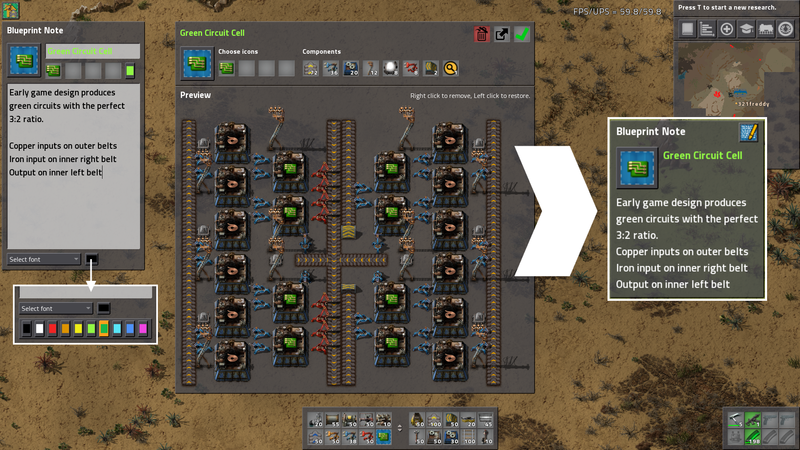 All notes are saved when you export a blueprint as a string (but you need the mod to read them). You can share blueprints and explain how they work using the notes. Perfect for complicated circuit contraptions. To view blueprint notes hold the blueprint item in your hand and edit the note by pressing the blue edit-button in the top right corner of note preview window. Alternatively you can right click the blueprint in your inventory to edit the note. Stick to the modded note window when editing title and icons of the blueprint. Clearing all the icons will restore the default ones. Notes are saved automatically and will be correctly stored in the blueprint strings for sharing. Entity notes can be created by clicking on the entity and then clicking on the blue note button on the top left corner of the screen. Notes are saved automatically. The note will be shown fully when hovering over the entity. Signposts have to be researched first (red science). 0.1.2 - Fixed startup crash due to conflict with mod "Creative Mode (Fix for 0.16)"
0.1.1 - Fixed crash when using deconstruction planner and setting up blueprints.